As you work to understand the central coast winds, I thought You might be able to explain the winds the last couple of days at Arroyo Laguna. If you look at the 11am to 3pm time period on Wednesday and Thursday for Arroyo Laguna, you see wind speeds on the 15-20mph range and a fairly normal direction. However the reality was that we were sailing 5.2-4.2 and max powered on Wednesday and 3.8-4.7 max powered on Thursday. The winds were also a bit more side-off than usual with the strongest wind inside blowing the tops off the surf. 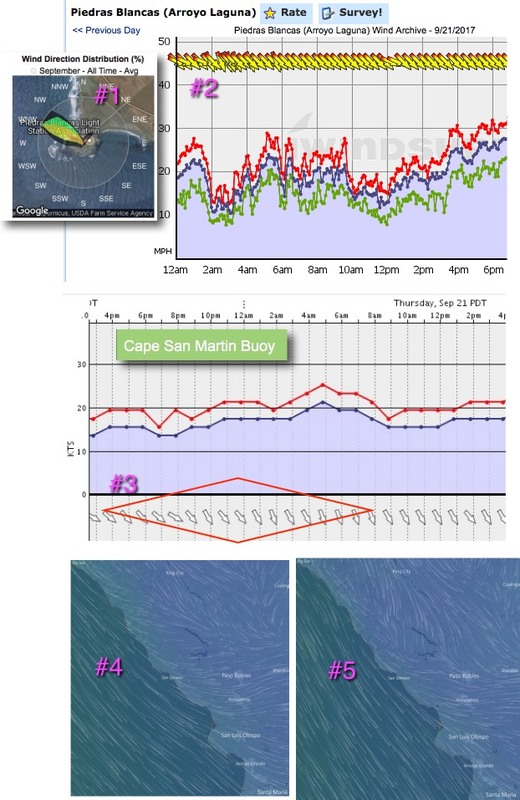 Was the true wind direction different than normal and Piedras Blancas was not picking up on the strong winds at Arroyo? There was definitely a disconnect between the two as Piedras Blancas normally would be a bit windier than the reality of Arroyo. Let us know what you think. Thx Hitech. I am not remotely, yet, an expert on the Central California coast winds especially since you can count the times I have sailed Arroyo on one finger. But in this case I can make a fairly useful analysis. Many sites along the coast such as Waddell, Piedras, Cabrillo. Leo etc have their winds slightly accelerated from a one sided venturi effect. This happens when the ocean winds compresses against the coastal hills or bluff and locally speeds up. In your case the venturi is most commonly focused near Piedras when the ocean wind is more WNW-NW which, as you can see in our archive data, image #1 is the most common Sept. winds at our Piedres sensor. When this wind shift occurs the max venturi will move further south which probably caused the acceleration you noticed at Arroyo. And with the venturi weaker at Piedras the sensor would read low compared to the wind at Arroyo. If you look carefully at the time slot the previous evening (red diamond) you can see when this wind shift occurred. The last two images also show this effect. Looking carefully at #4 you can see how the NW wind would focus a venturi at Piedras while more NNW winds #5 would focus it more to the south. There are hundreds of such effects we have to learn before we can do really useful forecasts for a region. After 20+ years I am still learning lots of new things about such effects in the Bay Area. It is not so much that I am a slow learner but rather that our wind pattens are changing from year to year compared to the norm 20-30 years ago. ‹ West Coast Wind Blog: 2017 Gorge daily fire expansion map.